The four heroes of justice have finally defeated the ultimate threat! Or did they? And can Sento finally thwart his father's plans? 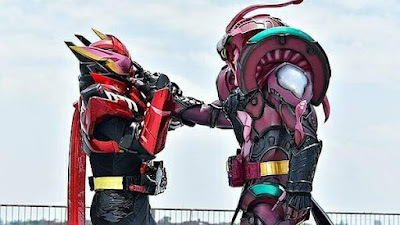 "The four Kamen Riders joined forces together and were finally able to defeat Evolt! Three Lost Bottles that were being held in Evolt's protection have been purified thanks to his defeat, and have been taken by Sento's father, Shinobu Katsuragi! Shinobu then proceeds to guide the others to a room containing the black Pandora Panel. He then starts to reveal to them his true intentions..."